Based on the manga by Tetsuhiro Koshita, Bakusou Kyoudai Let's & Go!! has two main seasons evolving around the Go brothers and the TRF Victorys. The third season, Bakusou Kyoudai Let's & Go!! MAX evolves more around two new main characters, but the primary idea is the same... Racing! Let's & Go!! focuses on Retsu and Go Seiba, two young brothers who receive racing cars called "Mini 4WD" by Dr. Tsuchia. From there on, the series portraits those two boys, training and customizing parts to later on participate on Japans Cup, where all of Japan's racers enter to be the best of the best! Adaptation: Bakusou Kyoudai Let's & Go!! As I sit here writing this review, my heart is split in two; should I write a favorable review? Or not? This anime is one of the first I've encountered; in fact, some of my earliest memories involves this anime. I remember the days I used to stroll through the flee markets with my mom, looking at toy race cars, wanting one but never having enough money. It definitely will have its place in my heart forever. That said, I wouldn't recommend this anime to everyone. It isn't a great anime, something everyone would enjoy. It's more of a kids' anime. The themes and storyline is simple and repetitive, easy for kids to understand. Yet it doesn't lose its excitement (from a child's perspective), though all 100+ episodes are basically the same (including the other seasons). Perhaps teens would think that this anime is too predictable or childish, but as a child, I really truly enjoyed it. Unfortunately, I assume not many children under 12 are viewing this forum. 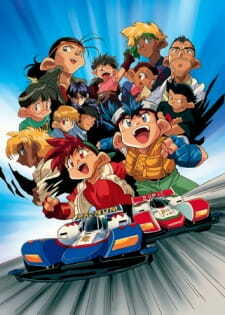 In the end, I am writing this review because I want people to know about this anime, as it has shaped parts of my childhood; at the same time, I know that it won't do the same for you, especially if you live in North America (I've not seen one toy racecar here...).